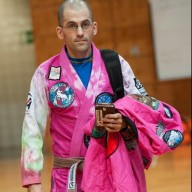 Discussion in 'Grappling Technique' started by BJJLDave, Aug 5, 2015. Here's the long awaited finale to the BJJ Library Challenge! Hope you guys enjoyed the series! Thanks for following along and for your patience waiting for each episode's release. So do I have to sign up for bjj library to see the final match? Really hope not, that would be kind of lame. I've really enjoyed this series. Hallman with the slick takedown. I like it. Really enjoyed the British guy's half guard pass. I get stuck there often. Will be drilling that bugger often. As always Hallman shows the good stuff. Yep, you have to sign-up for the BJJ Library to see the final match. Just as the round was starting I looked at the time on the video and was like, "Wow! Their match must end fast! There's only 2:30 left! ", and then the video cut off and I was like and then :icon_cry2. I lost interest after 2 episodes and the long wait in between them all. Can someone please give a summary of the Xande vs AJ match??? Cool episode, loads of good techniques in there. Great final fight too. For me, the final fight is the final of the Challenge, not the Xande vs the winner fight: the Xande one is a bonus. I don't begrudge them trying to get people to give BJJ Library a go, it's not like there weren't lots of good fights already in the free episodes. Of course, I'm already a BJJ Library subscriber and really like the site, so I'm biased. As they have been building up to the Xande fight, I can understand why people might be annoyed. Still, BJJ Library is an excellent site and you're getting a huge amount more than just a Xande vs the winner fight, you're getting all the great instructional material too. Here is the issue I have with this whole series. Second, the whole production of this was weak and not very interesting. Third, why did it take so long between episodes? Why did I have to wait weeks to see a new episode? Terrible way to keep the audience engaged. Overall, it was a really boring production and felt like the whole thing was rushed. Hopefully you figure it out because I won't be signing up or paying for anything with this type of production value. How much heavier is Xande?? Hey guys, we heard your feedback and have decided to release the full bonus match between Xande Ribeiro and the winner of the BJJ Library Challenge. Thanks for watching the series and hope you enjoy the free bonus footage! I apologize if we let any of you guys down by excluding it in the final episode and we will do our best to do better in the future.